That international’s pressure can have a good result – sometimes – is shown in today’s court order in Thailand to release Bahraini refugee footballer Hakeem al-Araibi. Bahrain dropped the extradition request, said the prosecutor working on the case. 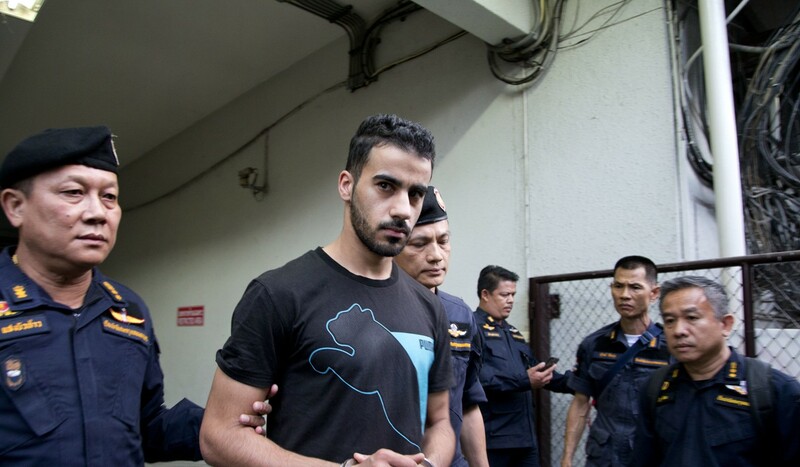 Monday’s decision comes after the 25-year-old footballer Hakeem al-Araibi was jailed for weeks in Bangkok’s Klong Prem Remand Prison. Bahrain wanted him returned to serve a 10-year prison sentence he received in absentia in 2014 for an arson attack that damaged a police station. Al-Araibi denied those charges. See also Craig Foster, Australian footballer and …human rights defender! Al-Araibi, who fled Bahrain in 2014 and received refugee status in Australia, was arrested in November at a Bangkok airport while on his honeymoon following an Interpol notice issued at Bahrain’s request. Australian Prime Minister Scott Morisson, meanwhile, praised the decision and said al-Araibi was on his way to the airport, where he should arrive in 12 hours from now. Craig Foster, Australian footballer and …human rights defender! And if he ever doubted just how powerful this sport can be, he only needs to recall the heartbreaking words of a young African refugee who had lost everything – fleeing his war-torn homeland after his parents, sibling and other members of his family were killed. “He was involved in a football programme over a period of time. He was very, very quiet and said very little,” said Foster. “He was in a new country and was experiencing psychological difficulties, which is totally understandable. “When he was asked why he liked the programme, he simply said: ‘The only thing that still exists in my life is football. It is the only thing that hasn’t been taken away from me’. And he was crying when he said it. …Since retiring as a player in 2002, Foster became involved in social issues related to football, working with disadvantaged, minority and indigenous communities in a variety of programmes. “I’m just finishing my law degree, which has given me some further insight into the challenges of human rights and international refugee law. I feel strongly about these issues and in football, we are at an advantage because we are the most diverse, multicultural community in Australia. …..Foster, who played for Portsmouth and Crystal Palace in England and also had a stint in Singapore, said he felt an obligation to give something back to the sport. As an ex-player and a broadcaster with the SBS organisation in Australia, Foster is in an ideal position to reach out to the masses. At the same time, he puts his contribution to social issues in perspective, admitting that he is in a position of comfort compared with activists whose lives are on the line in their efforts to effect change. “Of course, you can’t fight every battle, but there are key ones which take a huge amount time. But the people I have immense respect for are the human rights defenders in their countries….In Australia we have serious human rights issues, with indigenous Australians and also in terms of refugees and arrivals. Looking ahead to next month’s UN Forum on Business and Human Rights, ISHR featured this profile ISHR trainee and Thai lawyer Sor Rattanamanee Polkla. Sor describes her work improving access to justice for those affected by development projects in rural Thailand, and explains how she plans to use the connections she made with ISHR and others at the Forum to expand her network and support her community on the ground. I have written before about Andy Hall and his case in Thailand [https://humanrightsdefenders.blog/2016/11/07/andy-hall-british-labour-labour-rights-defender-flees-thailand/], and now a court in the Thai capital on Monday ordered the British labor rights activist to pay $321,000 in damages to a company that filed a civil defamation suit after he helped expose alleged human rights violations at its factory. The Washington Post and many others reported on this development. The Monday ruling involves four defamation suits filed by pineapple canning company Natural Fruit, which employed migrant Myanmar workers who claimed the company had abused them and broke labor regulations.Hall’s legal troubles stem from a 2013 report he researched for the Finnish consumer organization Finnwatch that alleged labor abuses at Natural Fruit’s facilities. They also concern an interview that he gave to Al-Jazeera on the subject, which was the focus of Monday’s ruling. Natural Fruit claimed that the report Hall helped research and his interview comments both hurt their business. 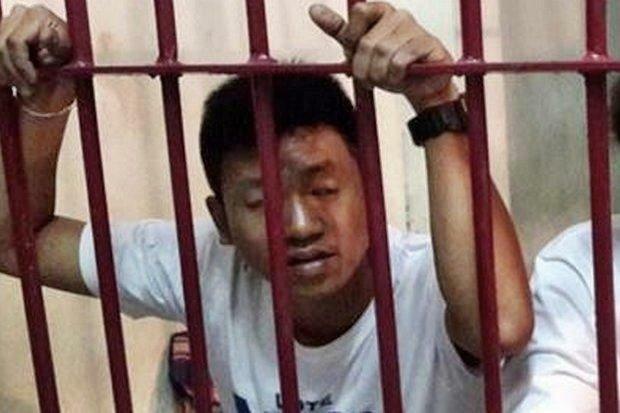 “This verdict is a major setback for rights of human rights defenders, migrant workers, labour/migration activists and researchers everywhere and casts a dark shadow over recent positive progress the Thai government and Thai industry has made to improve migrant worker conditions,” Hall commented Monday on his Twitter account. Civil society meanwhile marked the day at different locations around Phnom Penh and in other provinces. A group of 103 civil society organisations issued a joint statement calling for justice and respect for human rights from the government. “On the occasion of International Human Rights Day, we, the undersigned members of Cambodian civil society, call for an end to government attacks on human rights defenders and civil society groups and the lifting of unjustifiable restrictions on fundamental freedoms,” the statement said. On the observance of the International Human Rights Day, Presidential Spokesperson Harry Roque reiterated President Rodrigo Duterte’s commitment to uplift the lives of Filipinos, especially the poor, marginalized and vulnerable. Noting that the Philippines is an active member of the United Nations Human Rights Council and that respect for human rights is enshrined in the 1987 Constitution, Roque assured that the Duterte administration “works hard with the best interest of every Filipino.” ..“That direction is what inspires the government’s compliance with its human rights obligations. As a Nobel Peace Prize winner once said, ‘poverty is the absence of human rights” . The Philippines has experienced a precipitous drop in basic human rights standards since President Rodrigo Duterte came to power last year, resulting in large, mass mobilizations across the country for the occasion of December 10, Human Rights Day. At least 12 rallies were held across the archipelago on Sunday, with human rights group KARAPATAN and progressive alliance BAYAN taking the lead alongside a range of like-minded groups calling for an end to what they describe as the U.S.-Duterte regime. In addition to over 13,000 small-time drug dealers and addicts killed during Duterte’s “war on drugs,” Karapatan has documented 113 victims of political killings, 81 victims of torture, 54,573 victims of threat, harassment, and intimidation, 364,617 who have suffered due to indiscriminate firing and aerial bombing, and 426,170 internally displaced who were subject to forced evacuation. Turkey has been cited by several international organizations for human rights violations, namely in its justice system, freedom of speech and Internet communications, treatment of minorities, and political censorship. See inter alia: https://www.amnesty.org/en/countries/europe-and-central-asia/turkey/report-turkey/and https://humanrightsdefenders.blog/2017/11/22/celebrities-come-out-to-support-taner-kilic-amnesty-turkeys-chair-on-trial-today/. 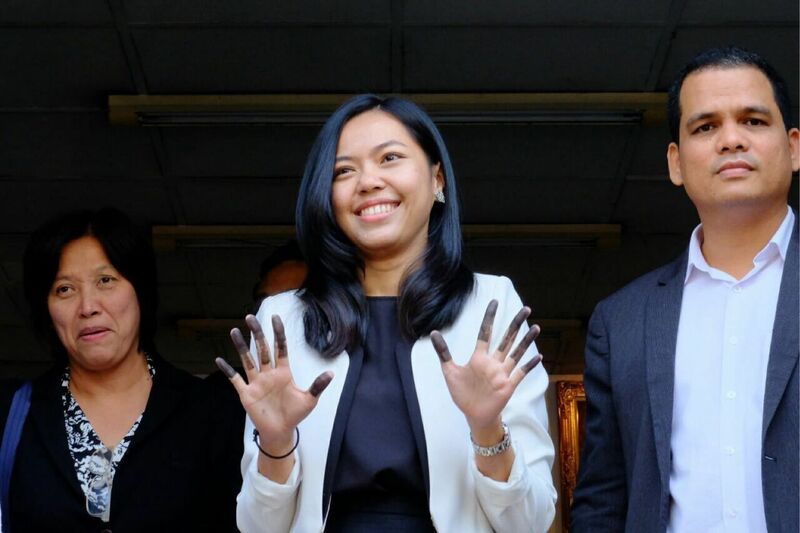 National Human Rights Commission (NHRC) commissioner and human rights defender Angkhana Neelaphaijit said that despite the government’s claim that it cherished human rights and had made them a priority, in reality it had done nothing to do so. Thailand is still far from its goal of valuing human rights since the junta’s policies and actions have eroded rights, while many people do not even understand the principle. Prominent Thai campaigners marked Human Rights Day yesterday to lament that the country was still far from its professed goal of ensuring everyone was accorded the freedoms they deserve. The nation’s most severe human rights violation was the lack of freedom of expression, they said in an appeal to the National Council for Peace and Order (NCPO) to restore democracy to truly guarantee human rights for every citizen. They also said Thailand faced many serious human rights crises. For instance, social movements across the country continued to be suppressed by authorities, the justice system was being used against human rights defenders, and many people in society still did not understand human rights and harmed others. National Human Rights Commission (NHRC) commissioner and human rights defender Angkhana Neelaphaijit said that despite the government’s claim that it cherished human rights and had made them a priority, in reality it had done nothing to do so. On the contrary, Angkhana said the government was doing the very opposite, enforcing many laws and regulations that violated human rights and curbing the activities of campaigners, both through law enforcement and by force. In effect, the regime was deepening Thailand’s human rights crisis, she said. Message by Foreign Minister of Pakistan : ”On behalf of the people and Government of Pakistan, I wish to reiterate our strong commitment to promote and protect human rights and fundamental freedoms, as well as needs. Pakistan has demonstrated its resolve by enacting wide ranging legislation, establishing strong institutional machinery and putting in place robust policy measures in the field of human rights. Pakistan’s Constitution serves as an anchor and guarantor of fundamental freedoms and human rights of all Pakistanis. The Government of Pakistan accords high priority to advancing mutually reinforcing objectives of development, human rights and democracy…This year is also significant for Pakistan in the field of human rights. Pakistan actively engaged with the UN human rights institutions and partners through regular submission of national reports, participation in review processes and implementation of recommendations arising from such mechanisms. Pakistan filed reports and participated in the review mechanism of three international treaty bodies, namely CAT, ICESCR and ICCPR. Pakistan also successfully presented its third national report on Universal Periodic Review (UPR) on 13 November 2017. This level of engagement, participation and contribution demonstrates Pakistan’s commitment as well as actions to advance the cause of human rights. Pakistan’s success as the newly elected member of the Human Rights Council (HRC) this year is a testimony to the confidence reposed in Pakistan by the international community as a consensus builder within the international human rights policy framework. The struggle against enforced disappearance was seen in Sindh alone while though there have been cases of missing persons in other provinces but Sindh has dared to raise voice against such violations of human rights. These views were expressed at a seminar on occasion of Human Rights Day organized here by SAFWCO and Social Change. Noted Human Rights activist and lawyer Faisal Siddiqui said only voice against forced disappearances was being heard from Sindh while voice of Balochistan has been crushed with force. Though many persons were missing in KPK and Punjab but from there no voice is heard. He said our judiciary has come out of colonization era and was giving right decisions. He said it was he who had filed petition in SHC for IG Sindh A.D.Khwaja. He said he was harassed for being advocate against Baldia Factory burning of 258 persons, Shahzeb Jatoi case and other cases for which he was harassed and could not open his office for many months. He said now powerful forces were active human rights. The gathering paid tributes to Pubhal Saryo, convener of missing persons forum who was whisked away by agencies and released after more than 2 months. Punhal Saryo said it has become very difficult to work for human rights in situation where human rights defenders were also not safe. On 15 August 2017, Jatupat Boonpattararaksa received a two and a half years jail sentence after pleading guilty to violating the lèse majesté law. The human rights defender – also known as Pai Dao Din – has been detained since 3 December 2016 in connection with his sharing of a BBC article on the life of King Vajiralongkorn on social media. Pai Dao Din, is leader of a student activist group called Dao Din based in Khon Kaen University. (https://www.frontlinedefenders.org/en/profile/jatupat-boonpattararaksa). The group advocates for community rights, social justice and democracy. He is also a member of New Democracy Movement (NDM), which opposes the military dictatorship in Thailand, a regime in place since the coup d’etat in May 2014. 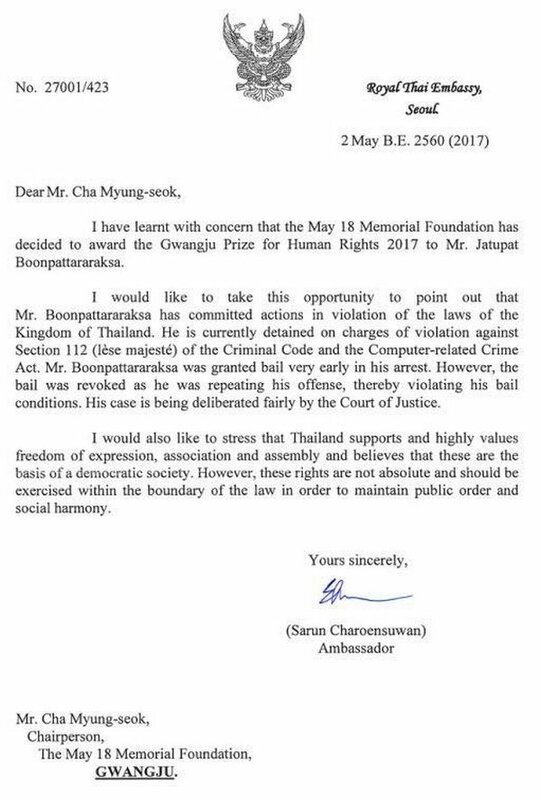 In May 2017, Jatupat Boonpattararaksa was awarded the Gwangju Prize for Human Rights [https://humanrightsdefenders.blog/2017/05/10/gwangju-award-for-human-rights-defender-pai-dao-din-upsets-thai-government/]The defender was originally sentenced to five years in jail, however this sentence was reduced after he pleaded guilty to sharing material deemed insulting towards the country’s monarchy. In the same context of anti-torture work in Asia, Amnesty International and the International Commission of Jurists issued today a statement calling on Thailand to finally follow through on commitments to prevent torture and ill-treatment. They regret repeated delays to the finalisation and passage of Thailand’s Draft Prevention and Suppression of Torture and Enforced Disappearance Act……Similarly, Amnesty International and the International Commission of Jurists urge Thailand to move ahead with its commitment to ratify the Optional Protocol to the Convention against Torture, which obligates authorities to establish a National Preventive Mechanism.. as well as to allow such visits by an international expert body. Such independent scrutiny is critical to prevent torture and other ill-treatment, including through implementing their detailed recommendations based on visits. Authorities should also act immediately on the commitment made at Thailand’s Universal Periodic Review before the United Nations Human Rights Council in 2016, to inspect places of detention in line with the revised UN Standard Minimum Rules for the Treatment of Prisoners, also known as the Nelson Mandela Rules…. Acts of torture and other ill-treatment in Thailand have rarely been investigated in a prompt, impartial, independent and efficient manner, as required by the Convention against Torture, and perpetrators of such acts have seldom been held to account. Amnesty International and the International Commission of Jurists urge authorities to ensure that such investigations are undertaken into all credible reports of torture and other cruel, inhuman or degrading treatment or punishment. The scope, methods and findings of such investigations should be made public. Where sufficient, admissible evidence is gathered, perpetrators should be prosecuted in fair trials in civilian courts. Amnesty International and the International Commission of Jurists also notes with concern the criminal prosecution or threats of prosecution—often under criminal defamation provisions—of victims of torture, their family members, and human rights defenders who have raised allegations of torture, including with a view to seeking redress. The organizations urge that such threats, investigations, charges, prosecution or other proceedings against these persons be are withdrawn and charges dropped, and that authorities take steps to create an enabling environment for freedom of expression in which people are able to seek redress and raise concerns about torture publicly without fear of reprisal or recrimination…. 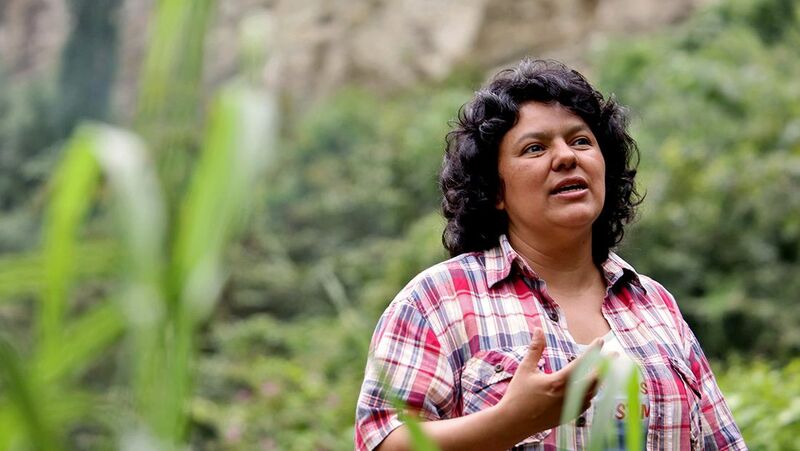 Itai, Berta, Sirikan and Narges are just a handful of the outstanding human rights defenders around the world who deserve recognition, but have instead been silenced by forces of cruelty, injustice and repression. Protection International opened the photo exhibition, ‘For those who died trying’ on the Place des Nations in Geneva on Monday, 9 May 2016. The exhibition run from 9-11 May and presented the photographs of 37 murdered or abducted human rights defenders in Thailand. It has toured or will be touring various countries (e.g. Thailand, Brussels, Pamplona) and as from 22 January 2017 a small town in the Netherlands, Dordrecht (www.defendersindordrecht.org), houses the images. The project looks to remember those who died defending human rights and protecting the environment by placing a portrait of the human rights defender, where possible, at the exact place he or she was murdered or abducted. It is vital, for the victims and their families, that their fight and their death is not forgotten and left un-recognised. Ultimately, those responsible must be brought to justice. Recognising those who died trying as HRDs and a better administration of justice are critical steps to end these killings. More information can be downloaded here: ‘For those who died trying’ photo exhibition.